The first-line treatment of encephalocele is reduction of herniated structures. Large irreducible encephalocele entails resection of the lesion. In such case, it is essential to ascertain preoperatively if the herniated structure encloses critical venous drainage. Two cases of encephalocele presenting with large occipital mass underwent magnetic resonance (MR) imaging. In first case, the skin mass enclosed the broad space containing cerebrospinal fluid and a part of occipital lobe and cerebellum. The second case had occipital mass harboring a large portion of cerebrum enclosing dilated ventricular space. Both cases had common venous anomalies such as split superior sagittal sinus and high-positioned torcular herophili. They underwent resection of encephalocele without subsequent venous congestion. 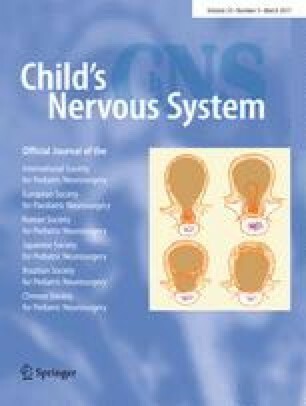 We could explain the pattern of venous anomalies in encephalocele based on normal developmental theory. Developmental theory connotes that major dural sinuses cannot herniate into the sac of encephalocele. Irrespective to its size, encephalocele can be resected safely at the neck without subsequent venous congestion. The authors declare that they have no conflict of interest with regard to this study.